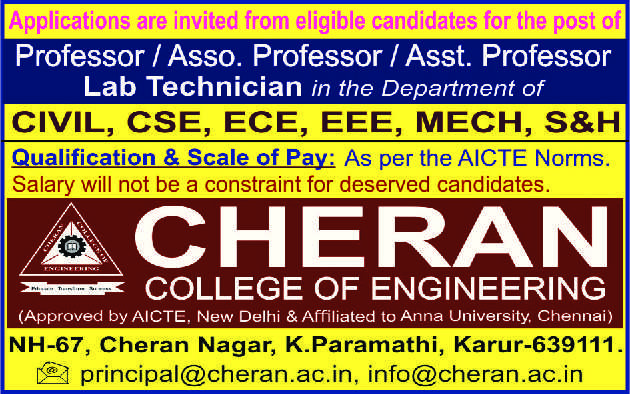 Cheran College of Engineering, Karur has advertised in THE HINDU newspaper for recruitment of Professor / Associate Professor / Assistant Professor Plus Non-Faculty jobs vacancies. Interested and eligible job aspirants are requested to apply immediately from 20th June 2018. Check out further more details below. About College: Cheran College of Engineering has been started in the year 2012 – 13 with an intake of 300. It is approved by AICTE, New Delhi and affiliated to Anna University. The College offers five under graduate programmes (Bachelor of Engineering) - Civil Engineering, Computer Science and Engineering, Electrical and Electronics Engineering, Electronics and Communication Engineering and Mechanical Engineering The college is located in a sprawling campus on Karur-Coimbatore National Highway (NH- 67) at Cheran Nagar, K.Paramathi, Karur – 639111.